Gifted by Virginia Jeffrey Smith. Gift from Virginia Jeffrey Smith of East Avenue, Rochester, NY, grand niece of Agnes Jeffrey. Part of the "Art of Four Generations of Jeffrey Family Women" exhibit sponsored by the College from June 27th to July 18th, 1976 at the Brodie Fine Arts Gallery Also shown in "The Genteel Pastime: 19th Century Watercolors by the Ladies of the Jeffrey Family" at the Memorial Art Gallery of the University of Rochester from December 9, 1988 to February 26, 1989. 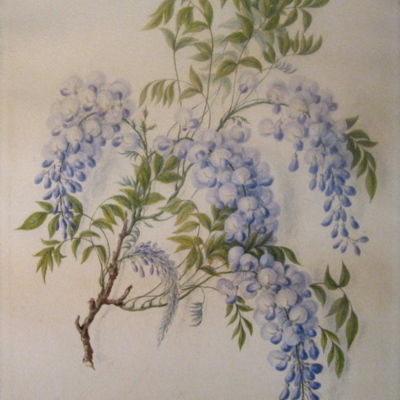 Agnes Jeffrey (1806-1896), “Wisteria,” LLB Galleries, accessed April 23, 2019, http://artgalleries.milne-library.org/items/show/234.